Yellow glass earrings, stained glass earrings, glass and metal handmade earrings are designed using a stained glass that is a beautiful golden yellow streaky bumpy stained glass. The glass earrings freely swing and catch the light. They have been soldered with lead free solder and given a dark patina and dark ear wires. They come packaged in a handmade fleece gift bag that is ready for gift giving or safe keeping. 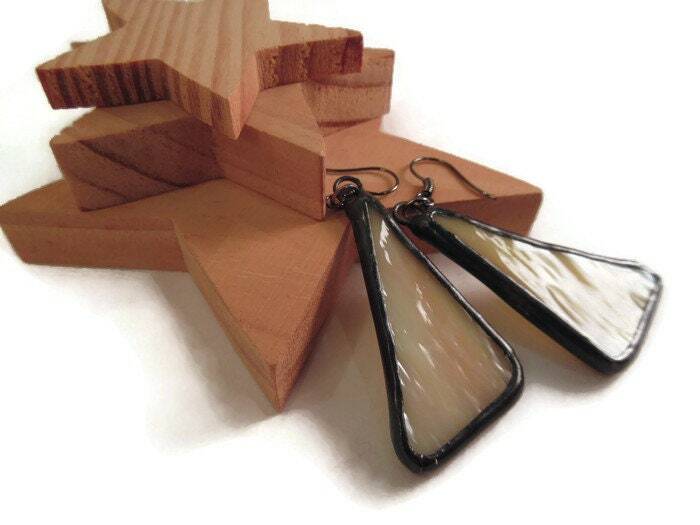 These Stained Glass Earrings can be a little too heavy for people not used to wearing long dangly glass earrings.